As with all pets, the right diet is a very important part of keeping your Betta fish happy and healthy. These little insect eaters require a specific diet and won’t thrive on just any foods, so you’ll have to do a little research to figure out what works and what doesn’t. Finding the “best” Betta food challenging at times, especially if you’re new to fishkeeping – there are many myths floating around about Bettas that it’s hard to know what is actually right. Which foods are “good” and which are “bad”? What should your feeding schedule actually look like? What do you do if things don’t work out as planned? 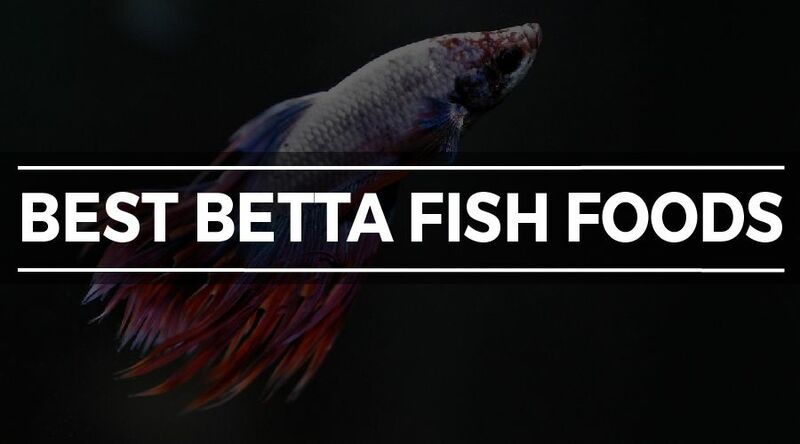 This guide discusses everything you’ll ever need to know about Betta fish food and feeding, including how to find the right food types and the best way to feed your Betta. 9.1 How much should I feed? 9.2 How often should I feed? 10.3 My Betta fish can’t find its food! 10.4 I’ve run out of food! 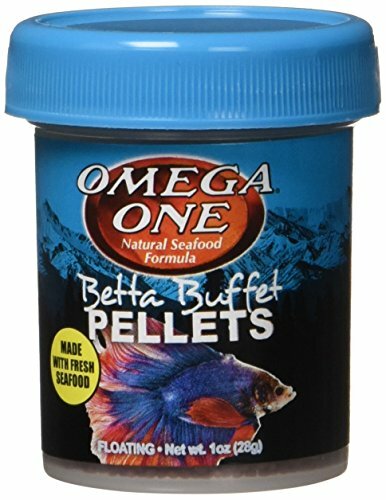 Omega Sea LLC Betta Buffet Pellets, 1 oz. This is one of our favorite Betta pellet foods because it has a nice and short ingredient list with few fillers and plenty of the whole fish that we’re looking for. In fact, there are no fish meals to be found in this food and it’s also completely devoid of plant-based ingredients besides the usual wheat. 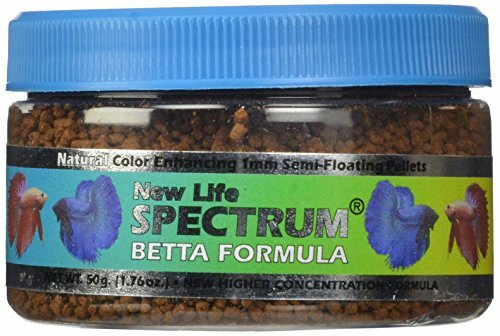 Another food with plenty of protein and not too many plant-based ingredients is the New Life Spectrum Betta Formula, which should also make a great staple option for your Betta fish. Although the main proteins are meal-based and there are slightly more greens in these pellets, there are no funky fillers like soy, corn or potato. Approved! BETTA FORMULATION: Nutritionally balanced diet is an ideal daily staple food for your Siamese fighting fish (betta splendens) and other top-water feeding tropical fish. FOR DAILY FEEDING: Advanced nutrition for the discerning fish-keeper. COLOR ENHANCING: Includes natural color enhancers for maximum beauty in your betta fish. 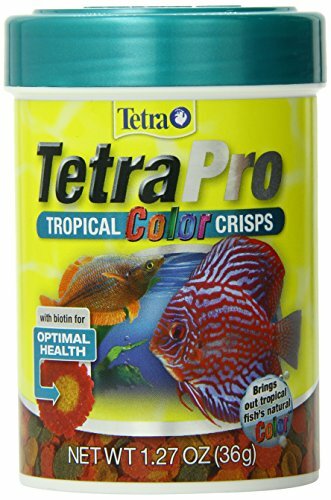 Tetra Tropical Betta Crisps are one of my favorite flake foods on the market. Although they contain a bit of fillers (what flake foods don’t? ), these flakes tend to be a lot more nutritious than other popular brands. I still prefer to feed my Betta pellets as the “main” meal, but these are great to mix in every few days to enhance color. Note: If you plan to feed floating foods such as flakes, I would definitely recommend picking up a feeding ring. They prevent flakes from going all over the tank, which helps increase water quality and decrease the amount of required cleanings. Like live foods, freeze-dried bugs like bloodworms are a subject of discussion in the aquarium hobby. Some aquarists like to avoid them because they are associated with bloating issues, while others have been using them for years with no issues whatsoever. While freeze-dried foods aren’t the absolute healthiest option for your Betta (they can be quite fattening and lose many of their leftover vitamins during the required soaking time), there is little reason to avoid them entirely. They work just fine as an occasional snack or treat. Soak them beforehand to avoid bloating issues and add a liquid vitamin supplement to the soaking water to make up for the lost nutritional value. I can’t even tell you how much Bettas love these Omega One Blood Worms. 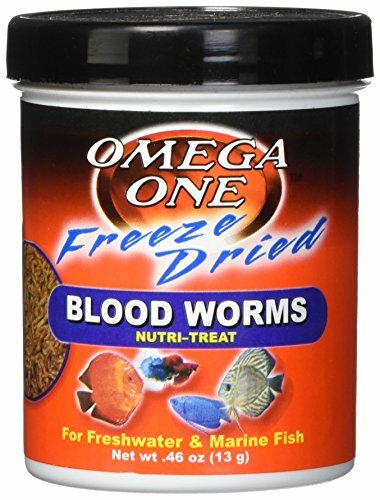 For those that don’t want to mess with live or frozen foods (but still want to feed their Betta the meaty diet that they crave), these freeze dried Blood Worms are the perfect option. Once again, I would suggest feeding these supplementary to pellets and flakes. Here are a few very easy guidelines you can follow when looking for a pellet/flake food for your Betta (just to make sure you get the highest quality). Remember: the ingredient list is your friend! As we discussed earlier, Bettas are mainly insectivores. They naturally feed on bugs that have fallen into the water and any little aquatic critters they come across. Although they might eat some plant based foods if they’re hungry, greens are not the main part of their diet. So how do you recognize a high protein Betta food? If the first ingredient on the list is plant-based, it’s probably a good idea to go for another product. Instead, look for something that contains a lot of protein-based ingredients like fish, krill and shrimp. Species-specific whole protein (like “whole herring”) is preferable to nonspecific protein meal (like “fish meal”). However, generic meal is still better than plants and plant meal (like “soy meal”). Also have a look at the crude protein percentage: most Betta keepers prefer foods that contain at least 40% crude protein. You might be wondering…if Bettas need so much protein, why do some foods contain so many plant-based ingredients? The answer is that plants are cheaper than fish or shrimp, so manufacturers prefer to use them as fillers to keep costs down – a rather annoying practice that makes it difficult for us to find high-quality foods that contain the ingredients that Bettas need! The search for foods that are high in protein goes hand in hand with the search for ingredient lists that are as low on fillers as possible. Do the first five ingredients mainly consist of plants like soy, rice or seaweed? If so, you might be better off going for another product. Additionally, if you see lots of questionable and barely pronounceable ingredients on the lower end of the list, this is also reason for caution. These ingredients are often unnecessary and not always good for your fish in the long run. Note: All Betta foods, even the highest quality ones, will contain at least some plant-based ingredients (often wheat flour). This is simply because without this addition, the desired food consistency can’t be reached. 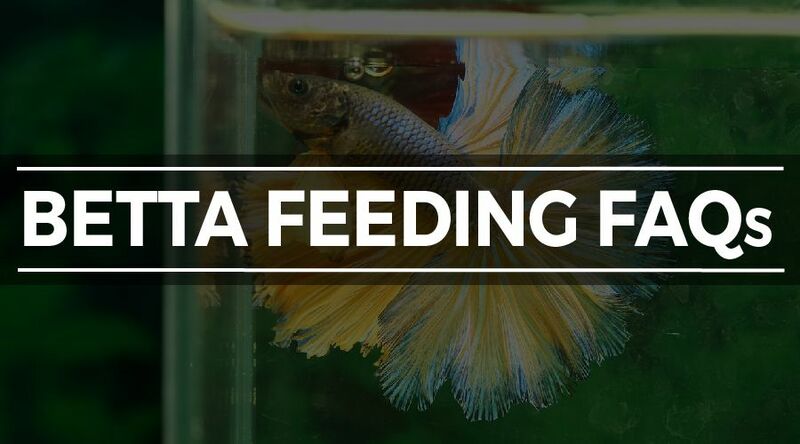 There’s more to Betta feeding than just tossing in a few pellets every day. Variety is important in any diet, and Bettas are no exception. Luckily there are plenty of food options out there that you can easily fit into your feeding schedule to switch things up a little. All of these frozen options can be fed a few times a week as an alternative to your regular pellets. Always be sure to thaw frozen foods before feeding and don’t re-freeze afterwards. Live foods sometimes have a bad reputation in the aquarium hobby. Occasionally, because store-bought live foods (like brine shrimp, blackworms, mosquito larvae, and vinegar eels) can contain parasites that might harm your fish. Don’t write off this option too easily, though: although store-bought live fish foods might not always be ideal, you can actually easily culture various tasty critters for your Betta to eat at home. We’ll discuss how it works a little later in this article. Live foods are our favorite Betta foods, as they stimulate natural feeding behavior and are a great way to offer some extra enrichment. Although a bit too fatty to use as a staple, live foods are definitely good to include in your feeding schedule. If you have a quick look around at your local pet or aquarium store, you’ll see tons of foods marketed towards Betta fish. 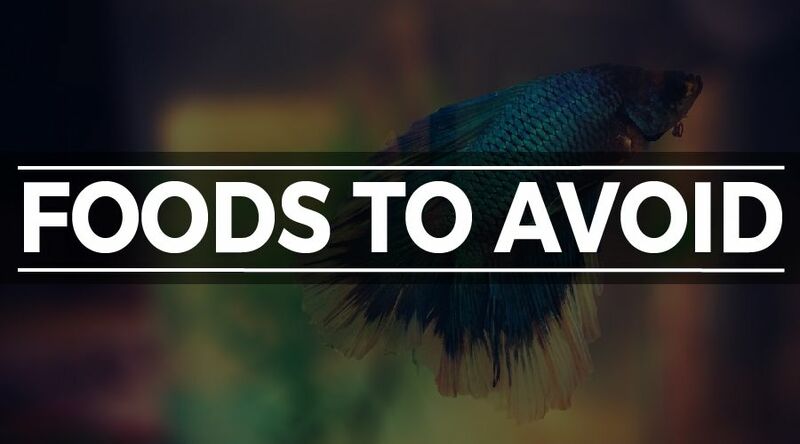 Not all foods are suitable for your Betta, though – even some of the foods marketed towards Betta fish owners are actually best avoided! Bettas need a specific diet that is high in protein. But how do you know which foods to avoid? The commercially produced product types below are a few examples of bad Betta foods. Because Bettas are naturally insectivores and they need plenty of protein in their diet to stay happy and healthy. Have a look at the ingredient list of any foods you’re interested in. If the first few ingredients are plant based, you’re best off skipping them. Generic flake foods are often marketed as suitable for all tropical fish. 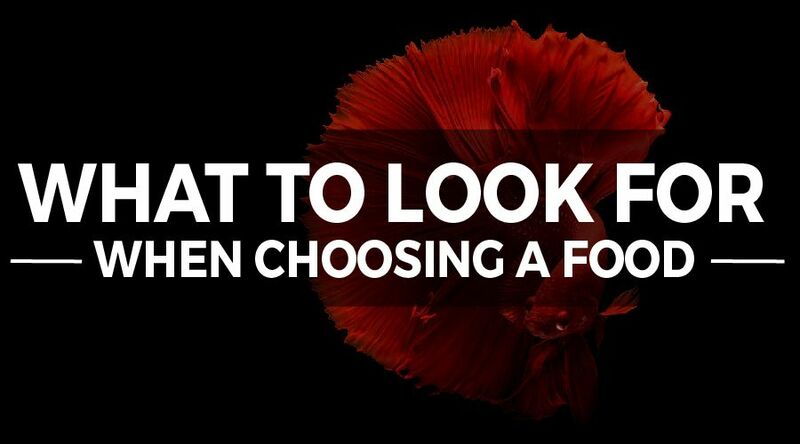 However, a quick glance at the ingredient lists of many flake foods reveals that they aren’t the best choice for your Betta. Not only are cheap flakes often low in quality, but they’re also high in plant matter and don’t contain all that much protein. Additionally, flakes often sink quickly, which isn’t ideal as Bettas prefer to eat floating foods. Even if a food is specifically listed as “Betta food”, that doesn’t mean it’s a foolproof choice. Not all Betta products are high in quality, and low quality foods can cause health issues for your fish in the long run. How do you recognize a bad Betta food? As always, take a peek at the ingredient list. Are there lots of fillers like wheat, soy and rice on there and barely any proteins like whole fish or least fish meal? Skip it! This text is still displayed on many Betta food containers (and fish food containers in general). But guess what? If you keep tossing in more and more pellets for two or five minutes, your Betta will keep eating them regardless of whether it still needs food. It doesn’t know the concept of being satiated. As a result, overeating is a real risk if you follow this guideline – bloating or even death is not unheard of. This is a description that often accompanies small vases containing a plant, water and a Betta fish. Sellers claim the Betta will eat the plant roots and its waste forms a kind of fertilizer for the plant. If you read the previous section you’ll spot the issue here right away. Aside from the fact that a vase is not a proper Betta home at all, Bettas are also not herbivores and they will not eat plant roots unless they’re starving. Whether it’s the bad water quality or the bad diet – the fish is doomed in this type of setup. These food blocks dissolve over a period of multiple days. Manufacturers (and some pet stores) to claim that they work perfectly to keep your fish well-fed while you’re away for a few days. In practice, though, these blocks are more of a danger than an advantage. 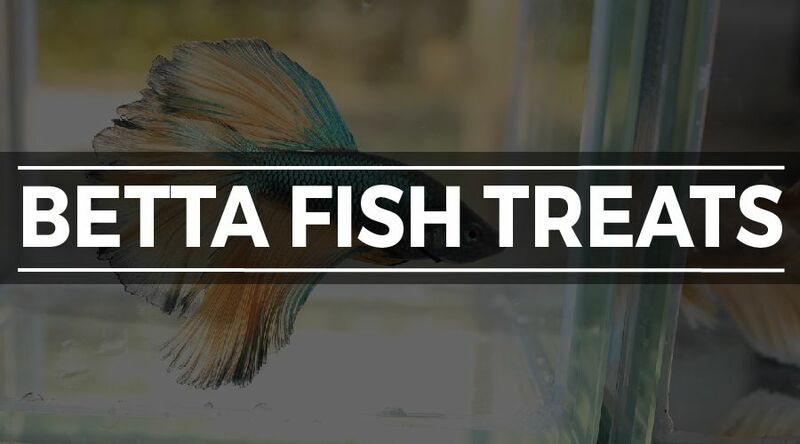 The dusty particles can progressively worsen water quality while the block dissolves and your fish can end up overeating, which means you’ll probably end up coming home to an emergency rather than a happy Betta. If you’re getting tired of trying to find the right commercial Betta food or just want to add some variety to the diet of your fish (which is very important! ), you’re in luck. There are actually a few great ways to make your own fish food, and it works for Bettas too. You can make food from scratch using the gel food method. Alternatively, you can go the live food route by hatching brine shrimp and fruit flies or even set up your own live food colony for a constant supply of Betta snacks. Gel food was originally ‘invented’ by goldfish keepers, as some fancy goldfish don’t respond well to commercial fish foods. The rest of the aquarium world has caught on, though: this is the easiest way to make your own (Betta) fish food at home. Although it might be a bit too messy to use as a daily staple, your Betta will love gel food as a snack! To make gel food, you puree all the ingredients you’d like to feed your fish and then bind them together using gelatin or agar agar. As you can imagine, recipes can be varied endlessly – which comes in handy when you’re feeding fish that require a specific diet like the insectivorous Betta. The food can be frozen and then thawed before using, so you can keep it in your freezer ready to go at all times. Here’s a simple recipe that could try (vary the amounts according to your preferred portion size; keep in mind Bettas aren’t big eaters). Because Bettas don’t eat much at a time, try using plenty of gelatin to make the mixture relatively stiff. This allows you to easily cut it into smaller pieces and prevents your Betta’s tank from turning into a mess. As discussed earlier, live foods are a fantastic Betta food option. If you want to add some variety to your Betta’s diet and stimulate its natural feeding behavior, hatching some bugs at home might work well. It’s not as gross as it sounds! Hatching your own brine shrimp – This is quite common in the aquarium hobby because it’s very easy. Brine shrimp are tiny saltwater crustaceans that produce dormant eggs which can be stored for a long time. To hatch a colony of your own to use as Betta food, all you have to do is find a brine shrimp hatching kit, follow the instructions and be patient. Your Betta will appreciate it. Hatching wingless fruit flies – If setting up a brine shrimp hatchery sounds like too much of a hassle, wingless fruit flies are an even easier option. This is a popular live food for “terrarium pets” like juvenile praying mantis and poison dart frogs, but because the flies lack wings you can easily feed them to your Betta as well. Just buy a fruit fly colony (they are sold in handy cups), give it a few days and start feeding. The cups can keep producing new flies for a long time. If you want a constant supply of live foods for your Bettas, constantly buying new brine shrimp eggs or fruit fly cultures can get a bit pricey. Do not despair: there are other options. Setting up a live food colony is not too difficult in most cases, and there are many tasty critters to choose between. Try blackworms, grindal worms, vinegar eels or the fully aquatic water flea. Now that we’ve discussed all there is to discuss when it comes to what to feed your Betta, you might be wondering how to go about it. What is the best feeding frequency? When do you feed which foods? Don’t worry: it’s all pretty straightforward. 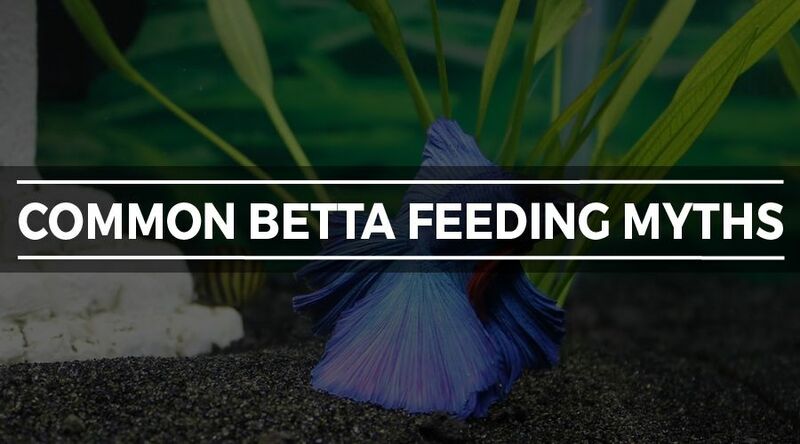 With the tips below you should be able to keep your Betta well-fed and avoid any major issues. We’ve also included a handy pre-made Betta fish feeding schedule to save you the trouble of having to come up with one yourself. As we discussed in the section on Betta fish feeding myths, you should avoid feeding “as much as your Betta can eat in X minutes”, as this is an easy recipe for overfeeding and a bloated, unhappy fish. Instead, stick to a total of 2-6 pellets, worms or other ‘food bits’ a day. This might seem like a large and unclear range, but keep in mind that variety is very important when feeding any fish including Bettas. Change up the amount a little every day. Also, don’t be tempted by your Betta’s adorable wiggle dance – it might beg for food as if it’s starving, but giving in to this behavior will just result in bloating. Be strong! Another important component of your feeding schedule is feeding frequency. While it might be easy to just toss the entire required daily amount of food into your tank at once, this is not the best feeding method. Fish aren’t adapted to eating large amounts once a day; they thrive on more frequent smaller portions. It’s a good idea to divide those 2-6 pellets into up to three portions with at least a few hours in between. Many Betta keepers also like to skip the food altogether and fast their Betta for one day a week to allow its system to clear out. You can do this if you want, but it’s not absolutely necessary as long as you keep things varied. Important: Your Betta might not notice all food that enters the tank, which means there might be some leftovers after feeding time. Don’t leave these floating in the water. Decaying foods can quickly cause bad water quality, so anything that hasn’t been eaten within a few hours should be removed to avoid problems. All the info you need to develop your own feeding regimen can be found above, but we understand that things might still be a little confusing. To help give you a clear idea of what a Betta fish feeding schedule should look like, we came up with one that you can use as an example. You can customize it to your liking: it’s not the only Betta feeding schedule, just a simple example that illustrates how you can vary feedings/amounts and incorporate snacks like live and frozen foods. Obviously things will look different if you feed gel foods, prefer different feeding times, want to include a fasting day, etc. Even if you do everything right, there’s always a chance you might run into some issues. This is also true for Betta fish feeding. If a problem has occurred, don’t panic: Bettas are hardy fish that don’t go belly up at the slightest issue and can go without food for a while if need be. Take your time to figure out what’s wrong and don’t do anything without researching first. Also, don’t instantly believe everything you read or hear. A few of the most common problems related to Betta feeding are discussed below. 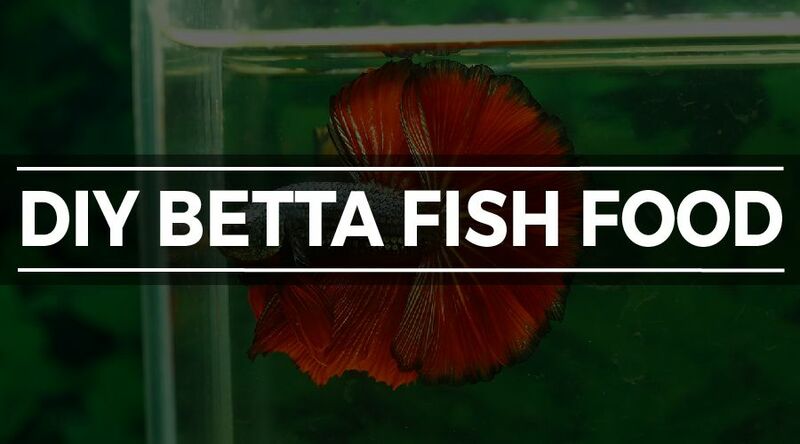 One of the most common issues with Betta feeding is when the fish refuses to eat altogether. There are a few different causes for this and luckily most are fairly innocent. First off, Bettas often stop eating if they’ve been put under a large amount of stress: have you just brought it home from the pet store? Have you rescaped its entire tank? Were there some water quality issues that had to be fixed? All stress factors can cause temporary refusal of food. If this is the case, the problem will resolve itself within a few days once your fish has calmed down. If it’s taking a little longer than you’d like you can always try to tempt the fish with some yummy frozen worms or even live foods – they’ll usually jump at the chance to eat those! Another reason your Betta isn’t eating might be that it isn’t used to the food type you’re using yet. As discussed earlier, some Bettas refuse to acknowledge flakes. Maybe the person who bred your Betta exclusively used live foods. Whatever the exact reason, your Betta will usually get hungry enough to eat unknown foods within a few days. Lastly, your Betta might be refusing food because it is sick. Diseases that affect the mouth (like infections) can make it impossible for your Betta to swallow. Alternatively, very sick fish might lose their appetite (which is a sign that it’s definitely time to take action). There isn’t much you can do if this is the case besides diagnosing and treating the problem as soon as possible (although you can try enticing the fish with some worms or soaking its food in garlicky water to make it smell extra tasty). Does your Betta look a bit too fat after feeding? Whoops, you might have overfed a little! No problem, just skip the next feeding to give its body time to deal with the excess food. If this is this happening regularly, be sure to review your feeding schedule (you can try comparing it to the one above) to make sure you aren’t habitually overfeeding. Try reducing the amount of freeze-dried foods and double check whether your staple food is actually high quality; we’ve discussed what to look for on the ingredient list a few sections above. Keep in mind – bloating might not always be food-related. It can also be a sign of a sick Betta. Bloating combined with raised scales is referred to as ‘dropsy’ and is a sign of organ failure. My Betta fish can’t find its food! This is an annoying issue that can occur if your Betta isn’t used to the food type you’re using or if your aquarium is densely planted. Luckily, this one is very easy to resolve: you can buy a feeding ring and offer food in there. Bettas are smart and will learn pretty quickly exactly where its food will appear (which usually leads to your Betta swimming towards the ring as soon as it sees you). I’ve run out of food! No worries. Your Betta won’t starve if it has to go without food for a little while until you can run out to the store or receive your online food order. Don’t panic or feed human foods like bread – just wait it out. Although Betta fish feeding has been made to look complicated by all the myths and rumors out there, it’s actually not that difficult. We hope this guide has been helpful in helping you figure out how to go about choosing foods and setting up your feeding schedule. Remember, the key points are simple – high quality foods and plenty of variety are all you need for a healthy and happy Betta.